The perfect antidote to the stresses and strains of everyday life, this offer combines a stay at the four star Rosslea Hall Hotel with a delicious meal, fizz and breakfast. 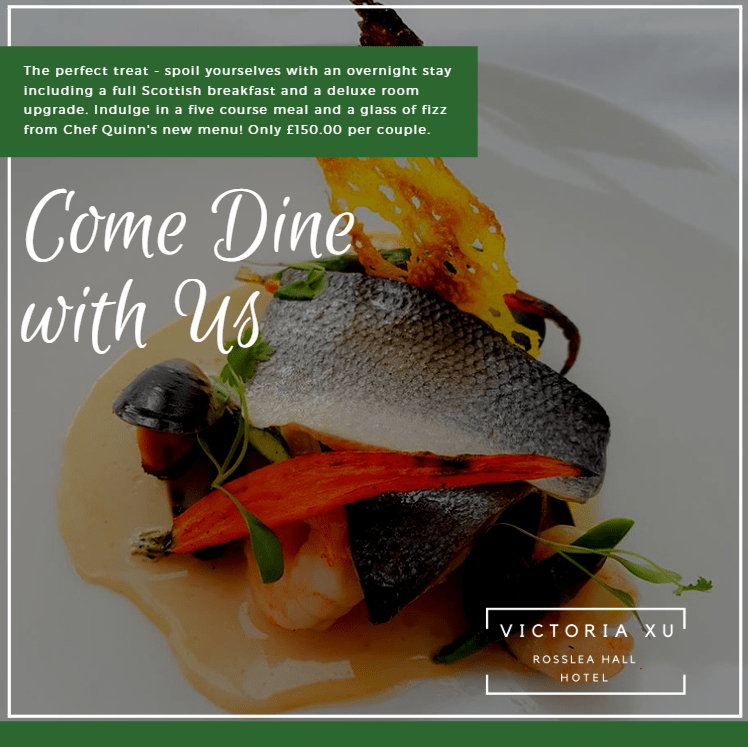 The perfect antidote to the stresses and strains of everyday life, our Come Dine With Us offer combines a stay at the four star Rosslea Hall Hotel with a delicious meal, complimentary glass of fizz and breakfast the next morning. This offer is available Friday, Saturday & Sunday nights. This offer is available Friday, Saturday & Sunday nights. Please check with us for availability before booking. Rosslea Hall Hotel is a Victoria Xu hotel. Victoria Xu Limited. Registered office c/o (4)3 Penywern Road, London, SW5 9TT. Registration Number: 11152727. VAT number: 264111633. Web design in Scotland : Carnoustie Creative. If you find a lower publicly available price on another website, we’ll match the lower price and also give you an additional 10% discount.